We love a good ‘steelie’ Honda CBR600F here at CB-Net, so here’s a run-down on the models we love, pre-FX! We’d hazard a guess that this – not 1969’s CB750 – was Honda’s (and biking’s) ‘most important bike ever’ but then this is a very arguable and moot point! What we do hate are the haters that say the CBR is a ‘dull’ or ‘boring’ bike… hell, this is a 150mph motorcycle we are talking about: and a bike that many of Honda and Honda Racing Corporation’s top design bods cut their teeth on. Anyways, here’s CB-Net’s part one of the classic CBR600 saga! The ‘jelly-mould’ fairing hid that classic steel frame, an inline four of 598cc with sixteen valves and around 70-80bhp, which could hit a top speed of around 150mph. It was around 10bhp up and at 182 kilos more than ten kilos down on the Kawasaki GPz600R which created the 600 sports middleweight class in 1985. Suspension/running gear consisted of 37mm forks, 276mm front discs and three-spoke 17-inch front wheels: changes in 1989 added rebound adjustability on the rear shock, modified fairing, a span-adjustable brake lever and the removal of the 1980s rubber side-stand ‘foot’ which none of us ever really liked! One of our favourite steelie models here at CB-Net: OK, so the Kawasaki ZZ-R600 was faster (but spongier all-round) and the FZR600 was sportier, but the attractive, new, bodywork hid an updated frame with braced engine mounts. The engine was now a ‘full’ 599cc and made around 85bhp with a true 150mph+ top-end. Information-share from the-then on-going CBR900RR FireBlade programme also contributed much to the FM’s development. Sturdier 41mm forks were now up-front and they gained rebound adjustment in 1993, when along came a remote reservoir for the shock with compression damping. Weight was around 185 kilos. Interesting price-wise that this model was so in the doldrums for a while, but is now picking up in value – especially with some rare, low-milers! If there was a class of sportsbike that supplanted the traditional ‘old’ 750s, by 1995 it was probably the 600 supersport class. 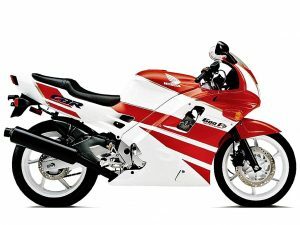 1995 saw the introduction of the Kawasaki ZX-6R and Yamaha Thundercat, so a ‘new’ CBR was badly needed. Instead of an all-new model, we got the F-S. This looked pretty much the same as the out-going model, but the slightly smoother aesthetics hid a ram-air system, larger carbs, higher compression for the motor and revised ignition which added up to 155mph and 95bhp. Chassis-wise you had a wider rear-tyre, revised suspension and bigger 296mm front discs. Weight was still 185 kilos. 1997/1998 updates included an improved ram-air system, ignition changes, a still-sleeker rear-end, new lights, alloy grab-rail and a racy white-faced tacho. 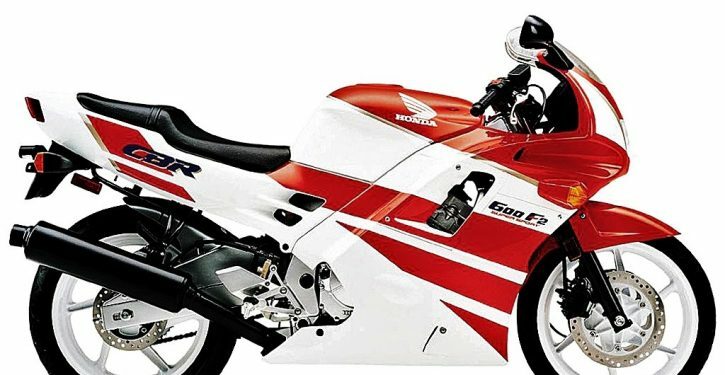 The-then humble CBR600F Honda was not the first machine you’d think of that would make a great race machine – but so it was. Firstly, like the Yamaha RD350 before it, the CBR spawned its own race series – 1987’s Honda CBR600 Cup – with such famous names as Brian Morrison and Eric McFarlane (who later ran Aprilia UK) taking part. Later Honda CBR600s would take on machinery from other manufacturers in the British Supersport 600 series. With the CBR being so good for the road – and such a trailblazer at the time – it wasn’t surprising that it started to clean up in the classes it was eligible for. The CBR was THE bike in 1987 through to 1989 then the Yamaha FZR600 took the laurels – although Paul Brookes took the 1989 British SS600 title on a Yam and John Reynolds took the unfancied Kawasaki ZZ-R600 to the title in 1990… Rumours were, it was a ‘special’ machine! With the new CBR600F-M coming in from 1991, things improved for Honda. It won the 1992 British 600 title in the hands of Phil Borley and later ‘steelies’ would win more titles courtesy of the partnership between Jack Valentine and the late-great Steve Mellor, who were the brains behind V&M Racing. They got a grasp on the mid-1990’s Supersport titles, winning first with Yamaha’s FZR600R in 1994 and then with the CBR600F. With riders such as Mike Edwards, Dave Heal, Ian Simpson, Michael Rutter, CBR600s took a number of British Supersport titles (1995 with Edwards, 1996 with Heal, and 1997 with Paul Brown) as well as a number of Isle of Man TT race wins.